In Boss Vegas, you inherit a casino and it’s up to you to make it a profitable establishment. You’ll have plenty of different tables and slot machines to choose from as you build up your casino. You will also need “Bling” which helps to keep your guest in your casino. If you run out of Bling, your casino could be closed down. Add more tables and decorations to increase your Bling rating. Click on customers to get coins and other items such as collection pieces. Buy the proper casino items to make your customers happy and keep them from leaving. Boss Vegas has a wide assortment of different gambling stations for your casino. You’ll find slot machines, poker tables, Blackjack tables, Roulette, video Blackjack, and many others. At higher levels, more advanced machines become available for your casino. Look to the icons above your customers to judge what machines you should be adding to your casino to satisfy the needs of your patrons. Collect your chips from your machines once they are full. Having decorative items will increase your Bling rating so be sure to add these once you can afford them. Each item will state its Bling rating so choose decorations with the highest Bling. You’ll find everything from holiday theme decorations, hedges, flowers, vases, planters, fish tanks, statues and more. There are dozens of different options here but the long scrolling list makes it difficult to find anything specific. There’s a rotate feature to see the item from another angle. A sort function would make it easier to find decorative items in the game. You can change flooring and wall covering too, which is standard in games such as Boss Vegas. There’s a popular feature and new button with the decorations feature. 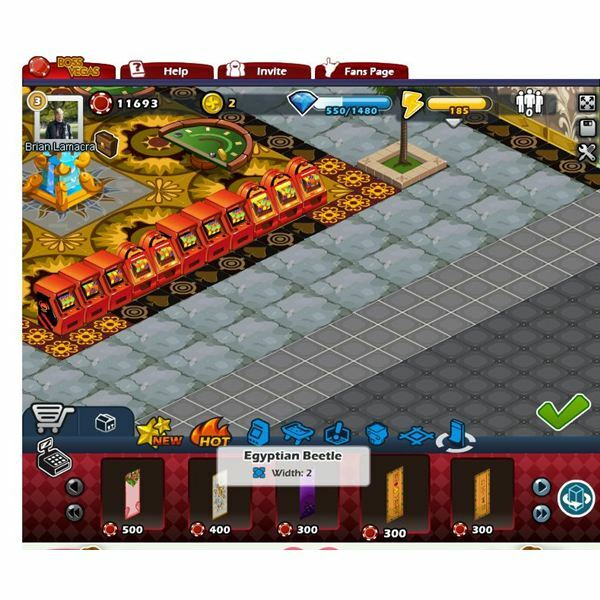 At level five in Boss Vegas, you can unique themed rooms to your casino such as Roman or Egyptian themes. Overall the decorative side of the game is well done. Boss Vegas doesn’t offer anything new to the casino genre on Facebook but the game is fun to play if you like building your own casino. There are plenty of decorative options and gambling machines to add to your casino. 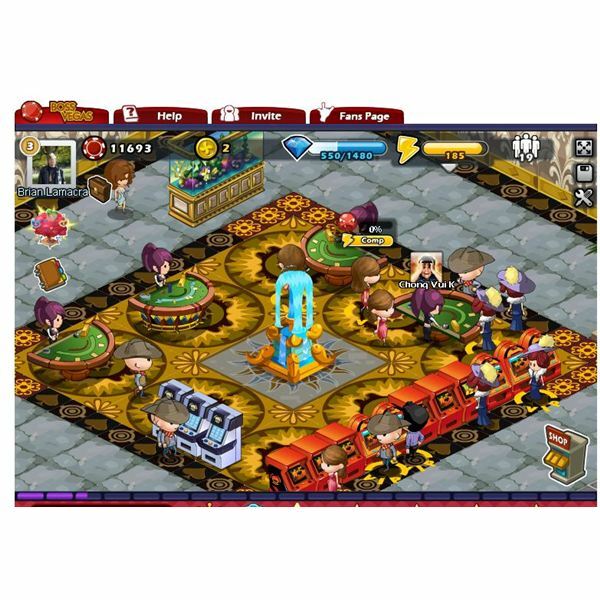 You can take quests in the game for added game play too which will teach you more about he various aspects of Boss Vegas. While pace the game is fine the game features annoying avatars. They move at a slow pace and will circle around and around your casino. Clicking on them to keep them happy can get problematic since with a larger casino you’ll have tons of avatars moving around. The graphics in Boss Vegas are decent but not outstanding. The game loads well and the soundtrack isn’t too bad. The avatars make a few sounds when you click on them. Clicking on a casino table will emit sounds too. It would be nice to hear some background casino sounds in the game, which would add to the atmosphere. In general, the game has the same style of graphics as many other Facebook game sin this genre. 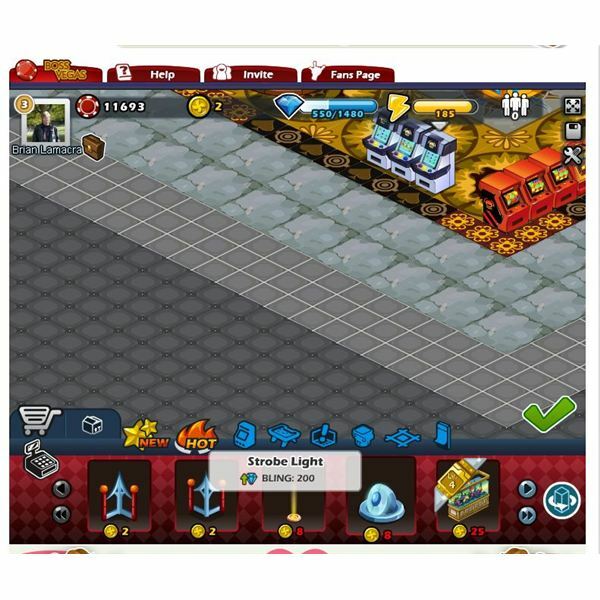 The game features a standard Facebook Interface. The shop icon in the lower corner is the only icon you’ll be using in the game. At the top of the screen, you’ll find your Bling, chips, game cash, energy, and the number of patrons in your casino. Missing is your experience level in the game which is odd. Your picture shows the level you are at but not how far until the next level which is annoying. With Facebook friends, you get bigger rewards when visiting them but you can’t do anything as far as which is disappointing. Gifts are available to send to friends like most Facebook games. Boss Vegas is a standard average Facebook game that doesn’t excel in any area. You will enjoy the game if you like casino style games are in need of another one to play. The game does have plenty of decorative options for the player to use. All images from Boss Vegas. Source: Article is author's own experiences with Boss Vegas on Facebook.